Your smile is important. It's one of the first things you notice when you meet someone. A whiter, brighter smile is beautiful - it can help you feel better about yourself and make a memorable impression. Your lifestyle and the aging process can stain and darken your teeth. Many things we do on a regular basis can contribute to stained teeth, such as drinking coffee, tea, cola and red wine or smoking. The Zoom2! 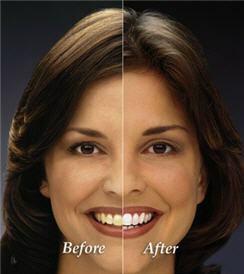 In-Office Whitening System is a revolutionary tooth whitening procedure. It's safe effective and very fast. In just under an hour, your teeth will be dramatically whiter. Zoom2! Whitening is ideal for anyone looking for immediate results. The convenience of Zoom2! in comparison to days of wearing trays and gradual whitening makes it the perfect choice for the busy patient. The Zoom2! light activated gel was developed after years of research by Discus Dental, the leaders in professional take-home tooth whitening. The gel is a scientifically formulated, pH balanced Hydrogen Peroxide that, when activated by the Zoom2! light, gently penetrates the teeth to remove deep stains and discoloration. With proper care and an occasional touch-up at home, your whiter smile will sparkle for years. Other whitening systems don't compare to the Zoom! Chairside Whitening System. Nothing whitens better or faster. Take a first step to feeling good, looking great. You owe it to yourself!